Carr Financial Group Blog | It's not just about money, it's about your future. It's not just about money, it's about your future. Please see below for the latest market insights from LPL Research. The Outlook 2018 offers detailed market guidance for the coming year. economic expansion has been unusual thus far, and what we may expect moving forward. to focus on growth, resulting in a new dynamic for business leaders and investors.  Fiscal coordination, with some combination of infrastructure spending, tax reform, and regulatory relief. on increasing productivity and attaining greater market share. where investors can determine winners and losers based on earnings, sales, cash flow, and so on. 8–10% for the broad stock market (as measured by the S&P 500 Index), with earnings growth the primary driver. important part of a well-diversified portfolio, however, particularly in the event of stock market pullbacks. long-term perspective and a well-balanced portfolio. As you likely know by now, one of the big four credit reporting agencies, Equifax, announced it experienced a security breach resulting in criminals accessing personal information of approximately 143 million Americans between May and July of this year. The compromised information included names, addresses, Social Security numbers, and dates of birth. In some instances, driver’s license numbers, credit card and credit dispute information were also compromised. This information is nearly everything that is needed to open an account in your name. *Content in this material is for general information only and not intended to provide specific advice or recommendations for any individual. Concerns of a political stalemate on the debt ceiling have been ongoing and showed themselves again on Tuesday, September 5 when the Treasury auctioned $20 billion in 1-month (4-week) T-Bills. The auction finished with the bills pricing to yield 1.30% (almost as much as the 2-year Treasury bill was yielding at the time, see chart below) as auction participants demanded a higher rate since the bills will mature in early October, which at the time was after the date the Treasury would run out of cash if the debt ceiling were not raised. This was the highest yield (lowest price) on T-bills since 2008, signaling that traders were concerned that a difficult path to a debt ceiling hike may have been ahead. LPL Research recently published an interesting article on the frustration investors have been experiencing with investment in high-quality fixed income. 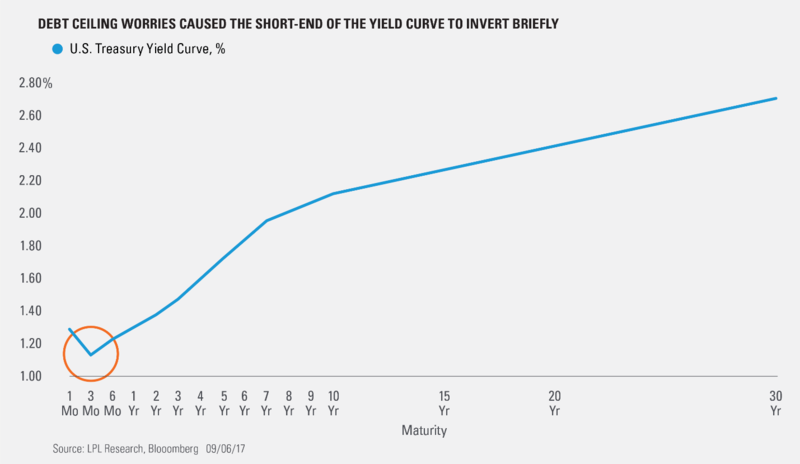 With interest rates being suppressed in the summer of 2016, investors were not rewarded for staying the course and maintaining investment in investment grade bonds. Despite the continued pressure on high-quality fixed income, the fact remains that high-quality bonds still hold a place in a diversified portfolio, as they have historically provided a way to mitigate losses in a market downturn. Below are some key takeaways from the article. You can read the entire article by clicking on the link below. The broad high-quality bond universe has produced a slightly negative return over the last year due to a pickup in rates from the depressed levels of last summer. Even with the headwinds, there have been pockets of success over the last year and opportunities remain. Despite the potential for ongoing pressure in high-quality fixed income, it remains a critical tool in diversified, balanced portfolios. guarantee of future results. All indexes are unmanaged and cannot be invested into directly. availability and change in price. rate of return and fixed principal value. However, the value of fund shares is not guaranteed and will fluctuate. as additional risks based on the quality of issuer coupon rate, price, yield, maturity, and redemption features. maturity, extension risk, the opposite of prepayment risk, market and interest rate risk. and regulatory risk, and risk associated with varying settlement standards. occur within a defined territory. Consumer Price Inflations is the retail price increase as measured by a consumer price index (CPI). and CMBS (agency and non-agency). Bloomberg Barclays High Yield Bond Index is an unmanaged index of corporate bonds rated below investment grade by Moody’s, S&P or Fitch Investor Service. The index also includes bonds not rated by the ratings agencies. guaranteed by Ginnie Mae (GNMA), Fannie Mae (FNMA), and Freddie Mac (FHLMC). makes no representation with respect to such entity. Despite the significant role of monetary policy as a market driver throughout this expansion, general investing principles have held true. The ability to form a good plan and stick to it, with judicious adaptation to the market environment, is the time-tested foundation of continued progress toward financial goals. If we are shifting to new market dynamics, including a greater role for corporate profits and fiscal policy, understanding the evolving opportunities will be important for diversified investors. DEFINITIONS The U.S. Dollar Index (DXY) indicates the general international value of the U.S. dollar. The DXY Index does this by averaging the exchange rates between the U.S. dollar and six major world currencies. The S&P 500 Index is a capitalization-weighted index of 500 stocks designed to measure performance of the broad domestic economy through changes in the aggregate market value of 500 stocks representing all major industries. The Bloomberg Barclays U.S. Aggregate Bond Index is a broad-based flagship benchmark that measures the investment-grade, U.S. dollar-denominated, fixed-rate taxable bond market. The index includes Treasuries, government-related and corporate securities, MBS (agency fixed-rate and hybrid ARM pass-throughs), ABS, and CMBS (agency and non-agency). The Bloomberg Barclays U.S. Corporate Bond Index measures the investment grade, fixed-rate, taxable corporate bond market. It includes U.S. dollar-denominated securities publicly issued by U.S. and non-U.S. industrial, utility and financial issuers. The Bloomberg Barclays U.S. Corporate High Yield Bond Index measures the U.S. dollar-denominated, high yield, fixed-rate corporate bond market. Securities are classified as high yield if the middle rating of Moody’s, Fitch and S&P is Ba1/BB+/BB+ or below. Bonds from issuers with an emerging markets country of risk, based on Barclays EM country definition, are excluded. The MSCI Emerging Markets Index is a free float-adjusted, market capitalization index that is designed to measure equity market performance of emerging markets. The MSCI EAFE Index is a free float-adjusted, market-capitalization index that is designed to measure the equity market performance of developed markets, excluding the United States and Canada. In business we often hear the adage, “Do more with less,” and we try to rise to this challenge. When workers can succeed in using their resources more effectively (in addition to just adding new resources), it helps drive economic growth. Economists call this side of productivity, “multifactor productivity,” and it’s measured by comparing economic output to the inputs required to produce it. In other words, it looks at how effectively existing machinery, equipment, and other capital inputs (in addition to labor) are being used to produce goods and services. Multifactor productivity is driven by things like technological improvement, the education and skills of the labor force, and efficiency in using resources. Both multifactor productivity and overall productivity have increased more slowly in the current business cycle than in prior cycles, suggesting that the recent uptick in firms’ capital spending may indeed continue. But this isn’t only about just more resources. Capital spending also often includes updating equipment and technology and committing to worker training to ensure that the new technologies can be used effectively. That, in turn, should lead to increases in profitability, worker compensation, and government revenues—thus boosting economic growth. As the chart below illustrates, multifactor productivity has been anemic since the Great Recession, consequently stifling labor productivity, as firms have opted to spend more cash on stock buybacks and dividend payments versus reinvesting in their businesses via capital expenditures. The Great Recession also contributed to a potential decline in skills following the largest disruption to labor markets since the Great Depression. The productivity slowdown indicates that stimulating productivity gains is challenging in the absence of workers’ access to resources that enable them to produce goods and services more efficiently. From an investment perspective, analyzing the underlying factors of productivity may be another way to help better forecast which market sectors and industries are better positioned to benefit from a pickup in business spending. Securities offered through LPL Financial, Member FINRA/SIPC. Investment advice offered through Private Advisor Group, a registered investment advisor. Private Advisor Group, and Carr Financial Group are separate entities from LPL Financial. The idea of sustainable investing is not new, and many investors relate the term to socially responsible investing (SRI), which is an investment strategy that excludes companies and industries on a basis of moral values (e.g. alcohol consumption, gambling). This type of strategy still exists, but it is important to note that sustainable investing has evolved beyond emphasizing exclusionary screening based on a narrow range of criteria. Today, greater emphasis is placed on which companies to include, rather than exclude, from a portfolio, giving rise to a range of complementary approaches that can be used to implement sustainable investment strategies. Sustainable investing continues to gain steam globally, with assets under professional management totaling $22.9 trillion, as of the end of 2015. Although more than half of these assets are in Europe, sustainable investing has also grown tremendously in the United States in recent years, with assets under professional management more than doubling from 2012 to 2016. Many forces are driving this growth, including increased awareness that ESG factors have a positive impact on performance and changing demographics, as millennials consistently express greater desire for some sort of sustainable investing solution. Also at work are changing social norms and the political polarization in the United States, leading some investors to want to see their social views represented in their portfolios. Given these results, we believe investors should not think of sustainable investing as shrinking the investment universe, but rather focusing on companies within that universe that may provide the best prospects. As investors continue to seek out sustainable investments, they are actively encouraging companies to improve their ESG scores. Thus, investing in these types of companies may result in better corporate governance, greater regulatory compliance and other positives. In our view, analyzing a company’s ESG factors as an integral part of traditional financial analysis can add value to investors’ portfolios. As more information and products become available, we anticipate that these ideas may become even more widely accepted, perhaps to the point where they are standard considerations for most investment managers, making it much easier for investors to implement a portfolio that reflects their values. According to American Funds, by the end of 2016, United States equities had outperformed international equities for 85 months based on rolling 3-year returns. This remarkable stretch for U.S. stocks has further cemented the widely-held belief that most U.S. investors have, which is that investing internationally is far too risky, and the returns stink anyways! Many do not see the purpose in investing in international companies, and rather invest in the familiar companies that allow the U.S. economy to thrive. The inclination to invest primarily, or exclusively, in the country you live in is known as home country bias, and it’s likely hurting your ability to construct a truly diversified portfolio. In our view, investing in one single country is the equivalent to investing in one industry or sector, or one form of fixed income. At first, most would disagree with this view, and use the 85 months of U.S. outperformance as evidence to support their claim. This form of “Recency bias” can easily be refuted by stretching out the period in which we view U.S. equity vs. International equity performance, shown below. Amazingly enough, home country bias exists across the world regardless of how small the country’s contribution to the global economy. Let’s use Australia, a much smaller developed nation, as an example. Per a recent International Monetary Fund survey, the average Australian’s investment portfolio consisted of 74% Australian equities in 2010, despite Australia only representing 3% of the world market. This outrageous disconnect represents a 70% overweight to domestic equities. In the United States, you could likely count on one hand the number of people that would have this allocation. For U.S. investors, the notion of international investing is considered risky. It’s true that many economies, especially emerging markets, have historically shown higher levels of volatility. However, this fact holds true only when viewed on a standalone basis. In fact, the investment across all economies in a more direct relation to their contribution to the global economy actually reduces annualized change in portfolio volatility, per a recent Vanguard study. Hopefully you can use this information as a way to recognize potential biases in your portfolio. Given the run for U.S. equities against international equities, it’s our view that now is the time to consider increased investment across global economies. More importantly, long-term investors should not neglect international investments for fear of adding risk to your portfolio, as your actions may be adding to the very problem you’re trying to minimize! *Content in this material is for general information only and not intended to provide specific advice or recommendations for any individual. No strategy assures success or protects against loss. Investing involves risk including loss of principal. International Monetary Fund (IMF) is an international organization created for the purpose of promoting global monetary and exchange stability, facilitating the expansion and balanced growth of international trade, and assisting in the establishment of a multilateral system of payments for current transactions. MSCI EAFE Index consists of the following 22 developed market country indices: Australia, Austria, Belgium, Denmark, Finland, France, Germany, Greece, Hong Kong, Ireland, Israel, Italy, Japan, the Netherlands, New Zealand, Norway, Portugal, Singapore, Spain, Sweden, Switzerland, and the United Kingdom. **Securities offered through LPL Financial, Member FINRA/SIPC. Investment advice offered through Private Advisor Group, a registered investment advisor. Private Advisor Group and Carr Financial Group are separate entities from LPL Financial. By historical standards, the new rate is still very low, and the projected increases are gradual. Wage growth, a dwindling supply of workers, and expectations of inflation growth are all factors with the gradual hike in rates. While many participants in this economy would dispute the improvement in wage growth and quality job opportunities, economists generally agree that a gradual increase in rates will help prevent an economy from “overheating” due to excessive business and consumer consumption. Variable rate loans, mainly credit cards and HELOCs, will likely rise shortly following any hike in interest rates. Usually, within 3 months, you should see a corresponding bump in your rates on these types of loans. What to do: Make sure you are aware of your interest rate % on your variable loans. Also, consider balance transfers and 0% introductory periods for your credit cards. For fixed rate mortgages, the lag for the interest rate hikes is not as clear cut. The Federal Reserve can only control the short end of the yield curve, meaning it cannot use its “toolbox” to materially impact longer term interest rates. Mortgage rates are usually more correlated to inflation expectations and demand for long term U.S. treasuries, and will not necessarily rise in tandem with a Federal Reserve rate hike. With that said, mortgage rates do tend to rise if there is a sense of optimism about the economy. We have seen rates tick up modestly within the past year, based on the long-term outlook of the economy per the Fed. What to do: Mortgage rates are still near historic lows. Explore refinancing or locking in a rate on a new home sooner rather than later. *Average 30 yr Mortgage rate since 1972, per the St. Louis Federal Reserve. Gray bars indicate recessions. For the conservative investor, the idea of earning any interest in a savings account over the past few years has been wishful thinking. Unfortunately, a rise in rates does not automatically mean a rise in your savings rate. Banks typically use the hike in interest rates as an opportunity to raise their profit margins, and not necessarily pass on any benefit to the consumer. As a result, increases in savings rates tend to lag increases in rates to consumer financing. What to do: Diligently shop for the best savings rate possible. Tying yourself to one bank will generally not result in the best possible rate. Some institutions utilize the rate hike as an opportunity to win business by sacrificing their margins for deposits. Make sure to check out online banks as well, as they can typically offer higher yields due to less overhead expenses.